How popular is the baby name Pamela in the United States right now? How popular was it historically? Find out using the graph below! Plus, check out all the blog posts that mention the name Pamela. LL Cool J’s hit “Around the Way Girl” came out in 1990. 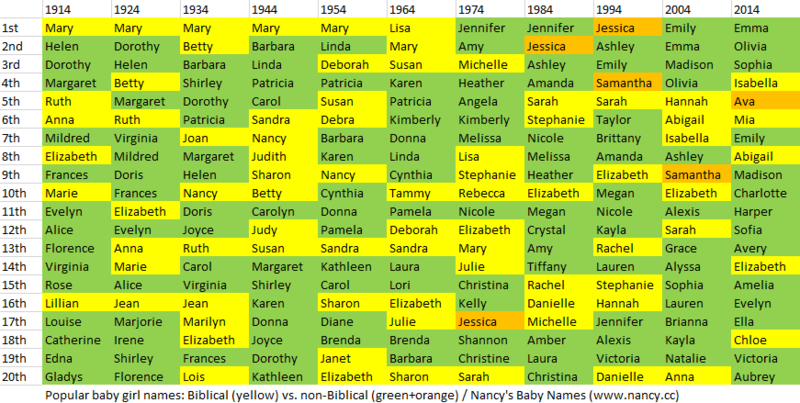 Which of these girl names do you like best? Which "Around the Way Girl" name do you prefer? Here are the popularity graphs for Lisa, Angela, Pamela and Renee, btw. Pam: Cyclone Pam, which hit the island nation of Vanuatu on March 13, prompted several new mothers there to name their babies Pam and Pamela. One of those babies, born to mother Trisha Ronald in the back of an ambulance, was named Charlotte Pam after both the storm and the Australian volunteer paramedic (Charlotte Gillon) who delivered her. Samuel: A baby born in Vanuatu at the end of March was named Samuel Kini Lovobalavu after “three different Fijian health officials – Health Inspector Samuela Bolalailai, RFMF Medic Sgt. Kini Nacagilevu, and Chief Health Inspector Kanito Lovobalavu.” The Fijian health personnel were in Vanuatu helping with Cyclone Pam relief efforts. Castor and Ramsi are two older baby name stories from the same region of the world (Vanuatu & Solomon Islands).